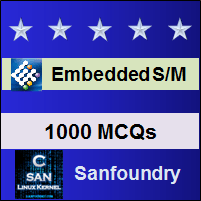 This set of Embedded Systems online quiz focuses on “Resource Protection-II”. 1. Which of the following uses a swap file to provide the virtual memory? Explanation: The Windows NT use a swap file for providing a virtual memory environment. This file is dynamic and varies with the amount of memory that all the software including the device driver, operating systems and so on. 2. What is the size of the swap file in Windows 3.1? Explanation: The Windows 3.1 have a swap file of size 25 Mbytes. 3. What is the nature of the swap file in the Windows NT? Explanation: The swap file used in the Windows NT is dynamic and it varies with the amount of memory that all the software including the device driver, operating systems and so on. 4. What limits the amount of virtual memory in Windows 3.1? Explanation: The swap file of Windows 3.1 have a size of 25 Mbytes and thus limits the amount of virtual memory that it can support. 5. Which of the following control and supervises the memory requirements of an operating system? Explanation: The virtual memory manager can control and supervises the memory requirements of the operating system. 6. What is the size of the linear address in the virtual memory manager? Explanation: The virtual memory manager can allocate a linear address space of size 4 Gbytes to each process which is unique and cannot be accessed by the other processes. 7. How many modes are used to isolate the kernel and the other components of the operating system? Explanation: There are two modes that are used for isolating the kernel and the other components of the operating system from any process and user applications that are running. These are kernel mode and the user mode. 8. Which are the two modes used in the isolation of the kernel and the user? Explanation: The two modes are kernel mode and the user mode which are used for isolating the kernel and the other components of the operating system from any process and user applications that are running. 9. Which of the following must be used to isolate the access in the user mode? Explanation: The device driver is used to control and isolate the access when it is in user mode. This is used to ensure that no conflict is caused. 10. Which mode uses 16 higher real-time class priority levels? Explanation: The kernel mode processes use the 16 higher real-time class priority levels and the operating system processes will take the preference over the user applications. To practice all areas of Embedded Systems for online Quizzes, here is complete set of 1000+ Multiple Choice Questions and Answers.